1997年DC 出版. 以超寫實主義的畫風敘述DC漫畫中的超級英雄們年老之後仍然奮力拯救地球的故事。編劇MARK WAID, 繪圖Alex Rosss. World's Finest是DC為二大明星Batman and Superman特別開的系列, 已有60年歷史, 幾乎有了Batman漫畫和Superman漫畫後, 就有World's Finest漫畫, 內容為Batman and Superman的聯手及互動. World's Finest 3本增厚合訂本全,Batman Superman的主要敵人: 小丑, LUX... 等等全出場!! 3本不分售共 NT$418. 以下古董級World's Finest (1974~1984) 每本NT$188 !!!! DC Comics將旗下所有的漫畫英雄聚集一起，創造Justice League of America (JLA) 美國正義聯盟: 閃電俠(Flash) 、鷹人(Hawkman)、綠燈俠(Green Lantern)、海底人(Aquaman)、蝙蝠俠(Batman),超人(Superman),神力女超人(Wonder Woman)等……2010電影上映!! #7-9, 12-14, 16-17, 21, 23每本NT$208; 其他集數已售完(請按下圖). 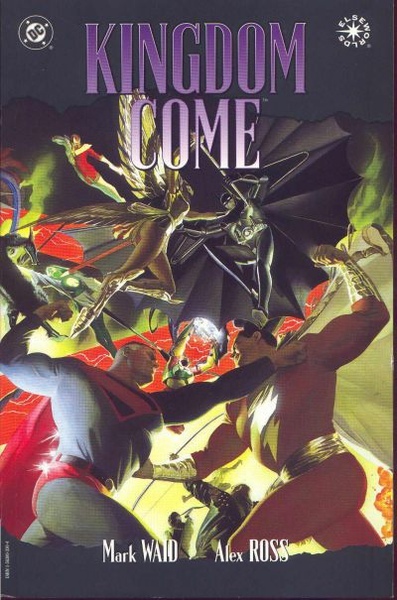 INFINITE CRISIS, 2005, DC英雄全出場, 7本合訂本已售出. 少年悍將Teen Titans長大後, 部份Teen Titans的班底Starfire, Cyborg, Changeling, Argent, 大羅賓(第一代羅賓)改名夜鷹Nightwing, 加上閃電俠...等, 組成The Titan。而其他少年悍將Teen Titans(Superboy, Robin, Impulse, Wonder Girl, Secret, Arrowette), 組成Young Justice. 卡通少年悍將 (Teen Titans，港譯少年戰隊) 是改編自美國漫畫 The New Teen Titans 的動畫影集，由卡通頻道播出。全五季65集。Teen Titans的漫畫1966年就有了,vol. 1: 1966 - 1976, vol. 2: 1996 - 1998, 現在是vol. 3: 2003~. 而卡通由漫畫改編, 自2003年開始, 共有5季(5 Seasons)65集.